What a treat this was - so much more than anyone expected! 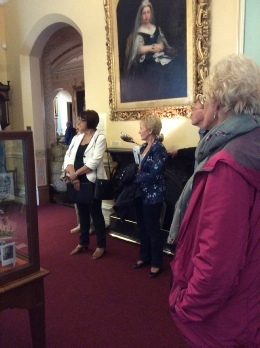 It was originally the home of Victorian textile millionaire Henry Isaac Butterfield and among the new displays are lavishly furnished rooms, providing a glimpse into how the family wined and dined their guests. As a former family home it’s impressive, even by opulent Victorian standards. There are four large reception rooms, all with ornate painted plaster ceilings, lavish drapes and furniture n the french style. A gothic revival vestibule with a huge pendulum clock impress and a sweeping staircase flanked by grand marble pillars lead up to fanciful stained glass windows. Local benefactor Sir Bracewell Smith purchased the building in 1950 and had it redesigned as a museum and art gallery so, as well as lavishly furnished rooms, there were also exhibitions of local crafts, Egyptology, costume, artworks, taxidermy, local history and (the piece de resistance) a stained glass collection from local churches made in the Morris Works and designed by such eminent Pre-Raphaelites such as Edward Burne-Jones, Rossetti and William Morris himself.